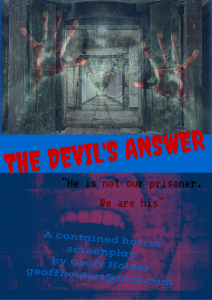 Very pleased to report that my contained supernatural horror THE DEVIL’S ANSWER has been optioned by Two Tribes, a production company based in Los Angeles. The logline: In a remote, snowbound prison run by a totalitarian regime, a dedicated torturer starts to believe that his mysterious, single prisoner is the Devil himself. The script was found on InkTip. Two Tribes are a new production company, and are now raising finance for a slate of three films including THE DEVIL’S ANSWER. This is my second option this year for a low-budget horror screenplay. This entry was posted in Movies and scripts, screenwriting, scriptwriting and tagged contained horror, geoff holder, Geoff Holder Author, Hollywood, horror films, horror movies, InkTip, Laddie Ervin, movies, Paranormal, screenplay, screenwriting, scriptwriting, supernatural, The Devil's Answer, Two Tribes on 06/10/2016 by Geoff Holder.